In a previous post, I griped about a fluorescent bulb that expired before its time. Well, I finally got around to changing it and what did I discover? The bulb had a meltdown. Yes, that is a burn mark around where the bulb meets the base. And, the heat did melt and eform the plastic base. I’ve never seen anything like this from an incandescent light before. Have you? I am in the light bulb business and YES we have seen this before. 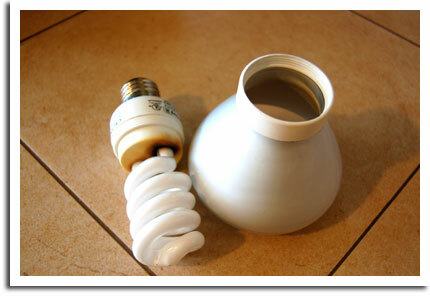 In fact, GE gave me R-40 CFL’s to put in my house and after a while the glass casing started to fall off and shatter all over the floor. Pretty scary when you have little one around the house. We sell a brand of bulbs that we have not seen these types of problems. Here is a link to our home products page. I would suggest not buying high wattages in R-40’s – stick a 16 watt and I think you will be please with the light output and less heat generation.